Who is it for? 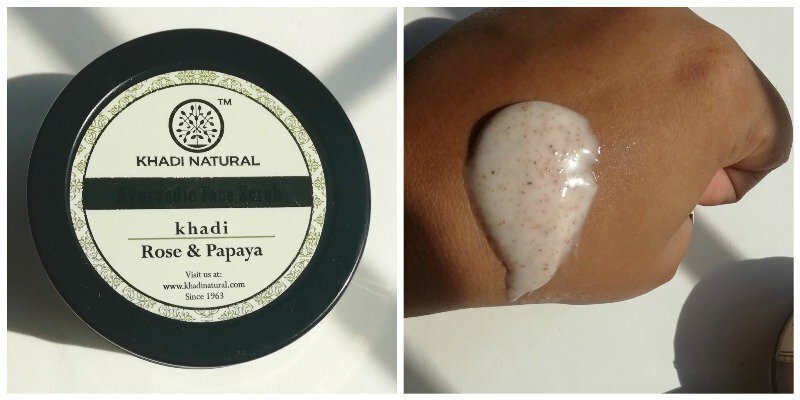 This Khadi Natural Face Scrub Rose and Papaya is for combination to dry skin, those with oily skin should not opt for this scrub. INR 100/- for 50 gms of product. Well I ordered this product from nykaa where the product image was different from the actual packaging. It comes in a transparent plastic tub with black wide mouthed screw cap. To keep the product secured it has aluminium foil covering beneath the cap. Just like the Nivea ones. This is so not travel friendly, unhygienic and messy. Well the name says it all. MILD rose and papaya fragrance which fades away quick. But it’s very soothing and relaxing. Thick creamy texture of milky white color. This moisturizes skin deeply and makes your skin soft and supple. After application I let the product stay of my face for 5-10 minutes. The product melts quickly and feels bit oily after applying. But then, it seeps into skin and nourishes the dry flaky parts of it. After exfoliating gently and washing off the product your skin will not feel greasy at all.This adds just the right amount of moisture to your face and leaves you with a glowing healthy looking skin. It does its job quite well. I don’t prefer too harsh or mild exfoliation; this just gives your skin the right amount of exfoliation. After exfoliating my skin felt extremely soft, nourished, clean and non sticky. I loved the complete experience. This scrub has loosely packed mild granules which takes care of the microdermabrasion part as well. I suggest you to give a nice massage for 5 minutes. Apply generously and spread the product evenly all over your face to get better results. Will I recommend or repurchase? Definitely yes. You can use it daily or twice a week as per your skin requirements. If you want to go for more coarse and gritty scrub then biotique papaya scrub is one good buy.